Raila Odinga Still Reaps Benefits From That Kenyatta Handshake! From left: Jubilee Party Secretary-General Raphael Tuju, ODM leader Raila Odinga and President Uhuru Kenyatta’s brother Muhoho chat during Jaramogi Odinga’s 25th anniversary at Nyamira ACK Church in Bondo, Siaya County. Calls for unity dominated speeches during an event to mark the 25th death anniversary of Kenya's first Vice President Jaramogi Oginga Odinga. "Without truth we cannot have justice; there can be no justice without reconciliation. Where there is no reconciliation, we cannot have peace; and that is why we need peace for development," Mr Odinga said Sunday. "In 1961, we were united when we wanted all political prisoners released. Jaramogi was the champion of this initiative and he paid a price for it. 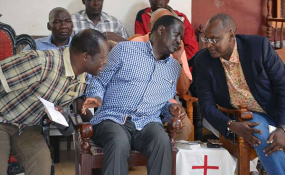 We are happy Kenyans have come together and this is what we want to build on," Mr Odinga said. More would be told about Jaramogi's history in the fight for independence during the main memorial service set for February 17 in Kisumu. The presence of Mr Muhoho Kenyatta, the President's younger brother, caught the attention of many at the modest ceremony. The President's brother praised the 'handshake' as the best thing that has ever happened to Kenya. "In the spirit of our founding fathers, Mr Odinga and Mr Kenyatta have done something that has united the country. This is what our forefathers would have loved. They wanted our country to unite and prosper," he said. Mr Muhoho's declaration that it was his first visit to Bondo took the congregation by surprise. "Most of you do not know me because I am not a politician. I do business and you only see me once in a while. It is my first time here but I will come back," he said. Mr Odinga later took Mr Muhoho for a tour of the mausoleum at Kang'o ka Jaramogi, after which they laid wreaths on the tombs of Jaramogi, Fidel Odinga and Jaramogi's wife Mary Ajuma. "I would like to congratulate him for his courage and leadership to do what is right for this country, and that is the 'handshake'. We are all committed to the pact," Mr Tuju said. Mr Odinga said Jaramogi's memorial will be held on February 17 in Kisumu County. "I do not want to pre-empt [it] but the lecture will be a good one and will give a rich history of Jaramogi," he said.